A member of the Poaceae family and native to Asia, bamboo is a giant grass with delicate, weeping leaves. This plant is distinctive for its notched or node stalk from which leaf-bearing branches grow. Most bamboo plants spread by underground rhizomes. Other plants share characteristics of bamboo, ranging from the weepy leaves to the notched-looking stems, but they are not related. Some bamboo varieties, including Teastick Bamboo, may be used as hardwood for furnishings and flooring. Also known as the Reed Palm, the Bamboo Palm (Chamaedorea seifritzii) may be mistaken for bamboo because of its white-striped stems that resemble the notched bamboo stem. Unlike bamboo, this plant has small feather-like palm leaves that grow from a central stem. The leaf stems may be weepy like bamboo. The Bamboo Palm is hardy in warm to mild climates, and can grow to 10 feet. The plant cannot tolerate temperatures below 28 degrees Fahrenheit. The Bamboo Palm prefers partial to full shade and needs regular water. Giant Reed (Arundo donax), also known as Spanish Cane, may be mistaken for bamboo because of its delicate, oblong, pointed leaves. However, this plant has a woody stem, rather than the notched green stem of bamboo. A member of the Grass family, Giant Reed is related to bamboo. This plant spreads by stem nodes and may become invasive. Often planted as a windbreak, privacy or erosion control, Giant Reed is believed to be native to Asia and is used to make some wind instruments. This bamboo relative is a perennial that grows in most zones, except the coldest, and prefers full sun and ample water. Heavenly Bamboo (Nandina domestica), also known as Sacred Bamboo, can be mistaken for bamboo due to its oblong, pointed leaves and cane-like stems. However, unlike bamboo, the foliage is purple-red when new and may be fire red in winter. A member of the Barberry family, this plant also produces white flowers and has green berries that age to red. 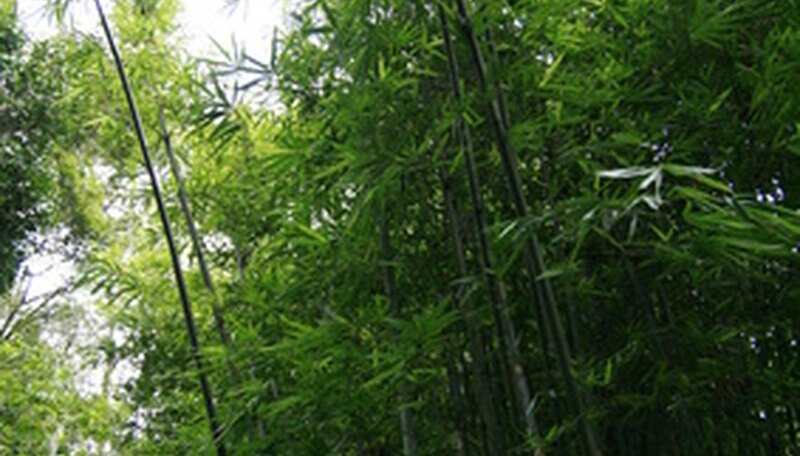 Heavenly Bamboo will lose its leaves in climates where temperatures drop below 10 degrees Fahrenheit, and will sustain frost damage below 5 degrees Fahrenheit. This plant thrives in full sun with moderate water.